Gorgeous, hot, sizzling, yummy, versatile...!!! 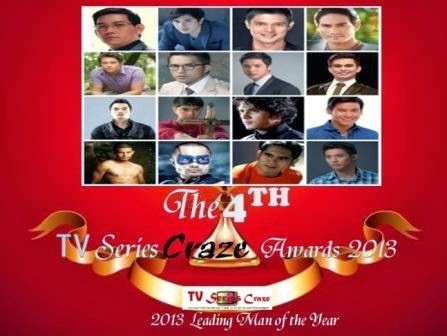 These are the characteristics of the actors vying for this year's Leading Man of the Year here in our very own 4TH TV Series Craze Awards 2013. All of your favorite leading men were fighting for the prestige title! For this year, the actors in the list are Richard Yap (Be Careful with My Heart), Coco Martin (Juan Dela Cruz), Paulo Avelino (Honesto), Dingdong Dantes (Genesis), Piolo Pascual (Apoy Sa Dagat), Enrique Gil (Muling Buksan Ang Puso), Dennis Trillo (My Husband's Lover), Alden Richards (Mundo Mo'y Akin), Tom Rodriguez (My Husband's Lover), Jake Cuenca (Maria Mercedes), Ejay Falcon (Dugong Buhay), Enchong Dee (Muling Buksan Ang Puso), Jason Abalos (Maria Mercedes), Derek Ramsay (Kidlat), Gerald Anderson (Bukas Na Lang Kita Mamahalin), and Rocco Nacino (Akin Pa Rin ang Bukas). Who among them is your choice?! Who is your Choice to be the 2013 Leading Man of the Year? Of course, if you think your bet leading man is not on our list, you may still vote for him and put his name on the others slot!